Ice crystals above clouds dance and flash according to electric fields. “Crown flashes” (or “jumping sun dogs”) are bizarre optical phenomena over storm clouds, moving like a searchlight or a huge light saber. It looks like the cloud itself is writhing! After I saw the video, I contacted a meteorologist I knew, and he was able to find the probable cause. First, clouds can generate enormous electric fields, generally due to rising and falling ice crystals rubbing against each other. The charges separate, and if enough of them build up, they reconnect electrically—via lightning. A typical bolt of lightning can have tens of thousands of amps of current flowing, which is a lot. Sometimes, long, needlelike ice crystals form in the air above a cloud. They can get an electrostatic charge, like when you rub a balloon against your hair. When they do, they tend to align themselves along the electric field of the cloud. When a lightning bolt discharges, the electric field of the cloud changes suddenly. This changes the orientation of the ice crystals all at once, so what you see is a flash of light whipping around. 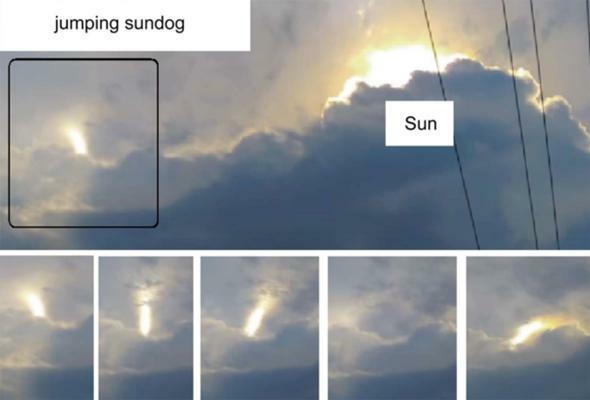 The general name for this effect is a crown flash (though it’s sometimes called a jumping sundog; “sundog” is itself a nickname for parhelia, bright spots 22° away from the Sun and parallel to the horizon, caused by ice crystals reflecting sunlight). In this new work, the scientists bounced a laser (representing sunlight) off a ferrofluid, and showed that the direction in which the beam got reflected changed as they repositioned the magnet, and it happened in a similar way as the real crown flashes above clouds. While this doesn’t prove the proposed explanation, it strongly supports it, and I find this hypothesis pretty compelling. I’ve never seen a crown flash myself; they’re pretty rare, and the geometry has to be just right to create them. Maybe someday. How cool is that? I don’t think my blog has ever been cited in a science paper before, much less been the starting point for the research itself! And, why yes, before you ask, I am pretty chuffed with myself over that. Look up! You never know what you might see.